Corn growers plant seeds in the spring with the hopes of harvesting a bountiful corn crop later in the fall. This year, local growers are also planting seeds for the future. The Buffalo Hall County Corn Growers, a local chapter of the National Corn Growers Association, are pleased to announce this year’s recipient of the 2014 scholarships. The student will receive a $500 scholarship funded by the Buffalo Hall County Corn Growers. Click here to see this year’s recipients. The Buffalo Hall County Corn Growers would like to congratulate these students. With such bright, motivated young people entering the field of agriculture, it is easy to be optimistic about the future. This scholarship is for area high school seniors who are planning to pursue an undergraduate degree in agriculture, agribusiness, or an agricultural vocation field, thus helping to insure the education of young growers and the future of American agriculture. If you are interested in applying for the 2015 scholarship, and someone in your family is a member of the Nebraska Corn Growers, please contact your high school advisor. The Nebraska Corn Growers is a national organization that is committed to expanding and enhancing the use, marketing and efficient production of corn, and doing everything within the capability of the association that will benefit the Nebraska corn producer. 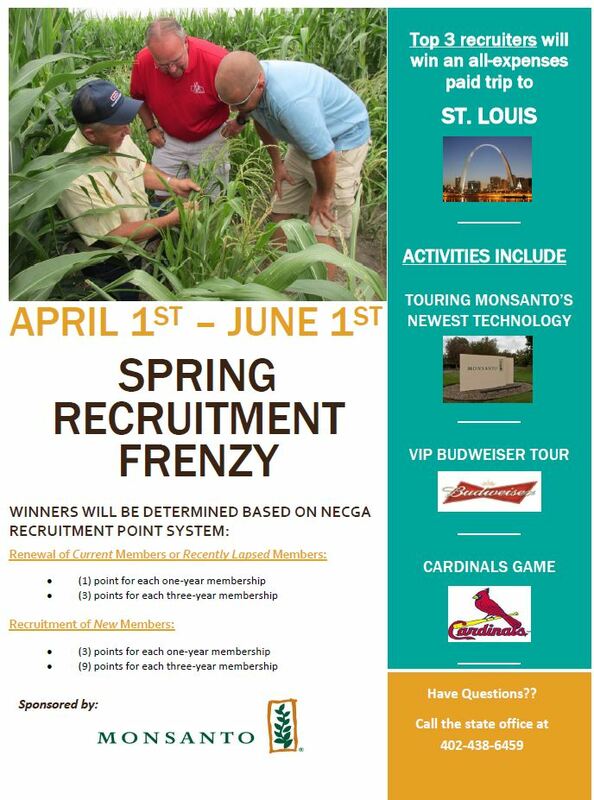 You’re invited to participate in the 2014 Spring Recruitment Frenzy, sponsored by Monsanto! From April 1st – June 1st, we will be holding a recruitment contest across the state. The top three recruiters will win an all-expenses paid trip to St. Louis! From touring Monsanto’s newest technology, to a VIP Budweiser tour, to attending a Cardinal games, this will be a fun and educational trip you won’t want to miss! The 61-day contest period will go fast. So spread the buzz, get excited and take an active role in growing our membership! Recap of all the events that happened during the 2014 NeCGA Washington D.C. Leadership Trip.